If you read my earlier post, you'll understand that I have been going through shopper's withdrawl. So, with kids in tow, I hit the shopping network (you all have them, but mine is Target, Marshalls, TJMaxx, Hobby Lobby, and any that might catch my eye for no reason). 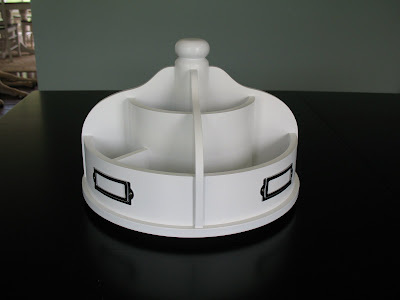 I've been eyeing one of these little craft caddies since I saw one in Pottery Barn (where else?) some time ago. 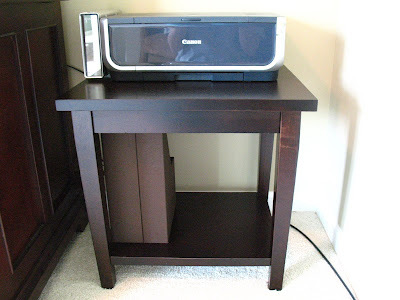 SOMEDAY when my project room is done, I will put it on my desk. Until then, it sits on my floor...waiting for a nice home. Speaking of sitting on the floor, my printer and DVD burner have been doing just that. I went to Meijer and paid 29.99 (not $30) for this little table. I put it together myself and voila! The best part is that I went to a thrift store (thanks Kimba) to see if I could have gotten a better deal, and they had old, beat up ones for $30.00! I got mine for waaaayy cheaper than that! Now for my find of the day. 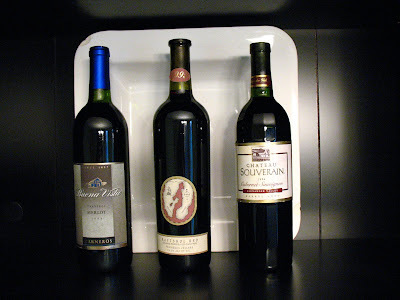 I was looking for a white platter to complete my hutch decor in the dining room. I saw this one, but it was pretty dinged up. However....it was only .70 cents!! That's right folks, not only did I get a great deal on the plate, but my camera does, in fact, take crappy close up pictures! Now you don't. Anyone looking much closer than that is gonna notice my three inches of dust waaay before they see the chips in the plate. Please note: The floral chair in the corner is because my husband has "ican'tgettothatrightnow" disease. I've asked him to move it for weeks, but therapy and medications take some time to kick in, I guess. I didn't get my apothecary jars, but I did get my seashells washed and put on display from Florida. We found all of them except for the star fish. I think we must have hit the motherload! I could say the sand was what was left over from all of our bathing suits, but I just stole it in ziploc baggies from the beach. My husband made us run back to the car. We're felons. 70 cents! NO WAY! LOVE THAT! I love a great bargain. And I love how you displayed your sand and shells. I have sand/shells from when my hubby and I went to Mexico. I think I know what to do with it now. Thanks for the inspiration. I love all of your new stuff. I never have the patience to find the good finds like you did! Congrats! I especially love the sand and the shells. Oh, you are making me HAVE to go to TJ Maxx!!!!!! I love that place! Your shopping spree finds ROCK! 70 cents? Are you kidding me!! Your hutch is accesorized bee-yoo-ti-fully! Love it! love it all!!! 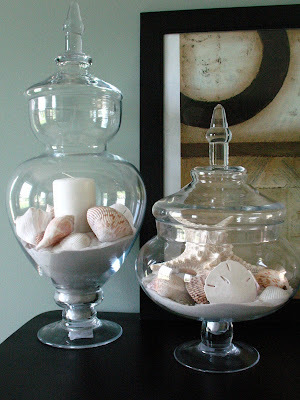 especially the beachy jars! Wow!! What some great finds! I know, I should go buy that tureen for $6.25 but the problem is you have to spend $10 to use a credit card unless you have cash and I never have cash! 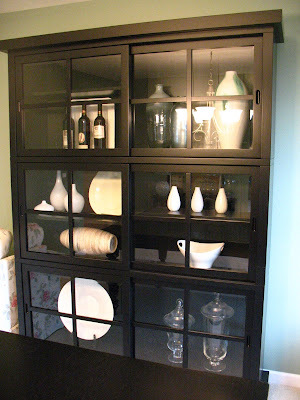 :) I love your china cabinet! You got some awesome deals!! Don't you love when you find a plate like that for such steal? 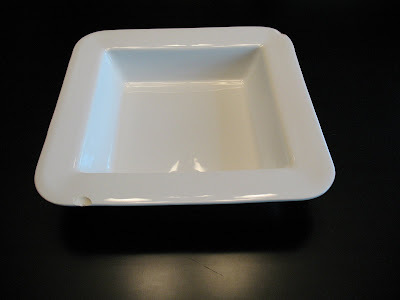 I buy plates at antique stores with chips..I think nothing of buying them at stores with them. I shop the same circuit AND my husband has that very same disease!! I've been trying to cure it for 7 years now. Go figure. I really love your stolen sand (thieves!) and shells - here I am in the middle of desert wasteland and I put out shells, sea grass, you name it every May through September to remind me of home! $29.99 huh? Good thing that you didn't pay $30 for it. Wow! Those are some good finds! 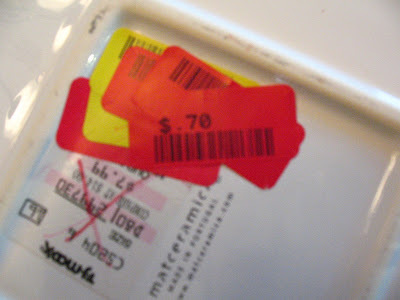 I havn't been to TJMaxx in a while. I think it's time for a trip. I made a comment earlier and then the blogger thing came up and said it was an error - ack - so here I am doing it again!! Your site is one of the best reads around - almost as good as my morning coffee!! You make me laugh and you inspire me!! Can you come decorate my house!! I need one of those 70 cent finds!! LOL!! 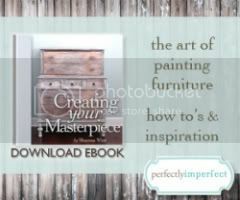 Have you considered interior decorating - you have got the eye for color, design and putting stuff together!! Love your idea of the seashells too!! Enjoying your blog and pictures. I started collecting sand in baggies a few years ago. Wish I had started sooner. Makes a cool display. 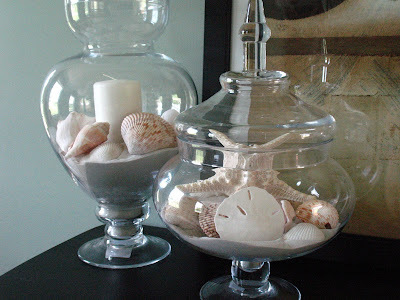 I have the same glass jar and I have white sand and a coral in it. Like your style! PS. Definitely try black paint.